Urban transport and accessibility took a center stage at the ‘Urban Mobility India Conference’ in New Delhi with CBM India hosting a panel discussion on accessibility and transportation in the cities. 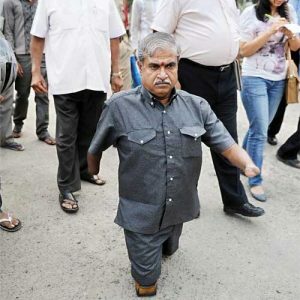 Struck by polio at the age of two, losing both his legs and hands at three, Koppa Singachar Rajanna has beaten the odds and risen from the ranks to become the commissioner for the disabled. The 54-year-old is an example to all those able-bodied people who lose hope at the sight of slightest hardship, and also an inspiration to those who curse their destiny for being physically challenged. Rajanna, a diploma holder in mechanical engineering, was also a champion sportsperson, bagging the gold medal in discus throw at an international paralympics event in 2002 and a silver medal in swimming. An entrepreneur who ended up providing employment to nearly 400 persons, Rajanna, a Congressman, was made commissioner by chief minister Siddaramaiah, a post hitherto held only by IAS officers. Struck early: Explaining his disability, Rajanna says, “I was down with high fever at the age of two, but my parents never took me to a doctor as they couldn’t afford it. I was treated by a village quack. One day, suddenly, they discovered that my hands and legs were paralyzed. His father, a farm labourer, however, did not give up hope and took it upon himself to address his son’s disability. “People used to call me names and my peers didn’t want to play with me. I felt unwanted. At school, my performance was bad as I couldn’t concentrate,” he recalls. “The headmaster of Koppa Primary School in Maddur taluk of Mandya district simply refused to admit me to school despite my father’s earnest requests because he felt I would be a burden on the teachers, that I would need help to go to the toilet,” Rajanna recalls, as tears well up in his eyes. His father Singachar then started teaching him the basics by making him write on sand. The then deputy commissioner of Mandya, SR Vijay, who got to know of his story through word of mouth, visited the place, took the headmaster to task and got Rajanna enrolled in the school. Against all odds: Rajanna credits his success to his passion for sketching and painting. “I started sketching at the age of five and graduated to painting when I was 10. I started by painting tractor trailers in Mandya,” he recounts. His paintings were exhibited at the Glasshouse in Lalbagh and appreciated by former governor Dhrama Vira, who later referred him to Karuna Gruha, a residential school for the physically challenged children of rural Karnataka. After graduating from the Association of Physically Handicapped Industrial Training Centre, Rajanna started a unit in Lingarajpuram and supplied parts to New Government Electric Factory (NGEF). After NGEF shut down, Rajanna concentrated on social work and politics. He quotes matinee idol Rajkumar’s super hit movie Bangarada Manushya as the prime inspiration of his life. Rajanna’s four children have names starting with V to signify his victory in life. “I have named my son and daughters Vinod Raj, Vidyashree, Vinutashree, Vinyolyashree, “he says, showering praises on his wife Bhagyalakshmi, an able woman who “married my heart and passion and not physical appearance”.